The Aerowing Rapid Desealing System (RDS) is a pneumatic hand tool which significantly improves the efficiency and strain associated with removing aircraft sealants and other adhesives. The RDS may be safely used to remove aircraft sealant from inside of fuel tanks, as well as exterior structure of aircraft, composites, windows, etc. The pneumatic Rapid Desealing System quickly de-bonds sealant 40 times faster than traditional methods. 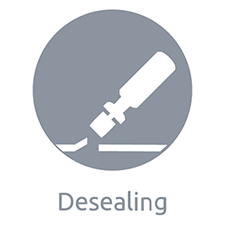 Aerowing Manual Desealing System (MDS) hand tool is for removing aircraft sealant and other adhesives from difficult access areas, and is available with different removal tips to cover different grooves and surface areas.